Interleukin-2 (IL-2) is the first agent available for the treatment of metastatic cancer that functions solely through the activation of the immune system. IL-2 enhances several aspects of cellular immune function and induces tumor regression in numerous murine tumor models. Clinical investigations with recombinant IL-2 have demonstrated that it possesses significant antitumor activity, producing durable complete responses in a small percentage of patients with either metastatic melanoma or renal cell carcinoma. The high-dose intravenous bolus IL-2 regimen developed at the National Cancer Institute (NCI) Surgery Branch received Food and Drug Administration (FDA) approval for the treatment of metastatic renal cell carcinoma in 1992 and malignant melanoma in 1998. 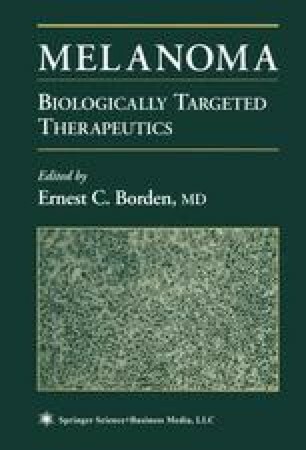 This chapter will review the in vitro effects of IL-2, the results of pertinent preclinical studies, and subsequent clinical investigations of IL-2-based regimens in patients with malignant melanoma.